ThisSideUp Acrobatics is an Australian all-male combo, currently (summer/autumn 2009) touring Europe, although sadly the only UK dates being the run at the Edinburgh Festival Fringe. 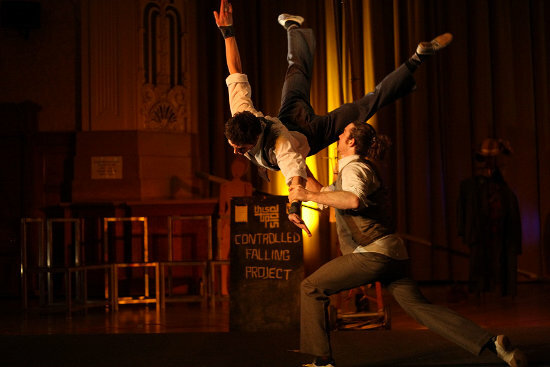 Controlled Falling Project invites us to ‘enter a laboratory of acrobatic impossibilities, where old science meets new circus in a heart-stopping, high-energy creative experiment’ – and, for once, what we get is pretty much what it says on the can…. The show is indeed full of thrills and spills, a clever piece of circus-theatre that manages to find a not-too-taxing narrative vehicle for a set of pretty impressive acrobatic/acrobalance tricks and turns, with the circus kit employed (teeterboard, Russian bar, and the deceptively simple looking Roue-Cyr hoop) woven into the story, which circles around a mad professor clown character obsessed with measurement, our bold three-strong team of acrobatics being his willing guinea pigs. The Edinburgh Fringe version of the show seen by this reviewer is set inside a circus tent of sorts—a great purple upside-down cow run by the Underbelly venue and once called, unfortunately, the Udderbelly—a name that has stuck despite its re-naming as the E4. The audience are sat in steeply raked seats, on three sides of the performance space, which affords good views for all of a show with a great deal of floorwork. The boys enter with a swagger to a Tommy Dorsey swing track, sporting 40s suits, ties, and hats. Easy does it at the start, with gentle clowning, hat juggling, and some simple but beautifully soft and easy tumbling, as ‘Professor Archimedes’ dons his lab coat and sets the scene—fussing with his blackboard and pulleys, tripping over equipment and taking a fair few pratfalls—and the trio establish their characters. There’s lots of teasing, jibing and good-tempered male rivalry games played out onstage, with many a flirtatious nod or toss of the hair (or hat) directed at the audience. It’s a rare thing to find circus performers with this skill level equally at home with physical theatre and comedy, but this lot are true all-round entertainers, and the whole piece flows easily throughout the hour, finding just the right balance between show-stopping tricks, storyline and comic character play. Mention must also go to the music, which is mostly a recorded soundtrack that mixes 40s swing, waltz, ethnobeat, and drum and bass effortlessly, but augmented by live percussion (played by ‘the professor’ on a miniature drum kit, and also—Stomp style—on anything else to hand on the set) which cleverly adds the classic circus in-the-moment tension-build (and also provides a kind of ‘oh well, try again’ response to the very occasional drop or failed trick). Then there’s the set design—a kind of cartoon version of a physics lab, with lovely old-school pulleys, ropes, and cogs powered by a bicycle; a blackboard covered with mathematical symbols; numerous chairs and desks; and a selection of oversized measuring tools, including a wobbly giant ruler that somehow turns itself from Chinese pole to beam to tightrope. Thrown into the equation are a life-size jointed model figure (used as both crash-test dummy and dance partner), and a selection of smaller wooden models that provide a puppet theatre prelude of tricks to come. All in all an exceptional circus-theatre show—skilful, witty and well executed. Not only do the company manage that near-impossible task of finding a suitable storyline for a circus-theatre show, and then justifying dramaturgically the tricks and turns demonstrated as part of this story (which is, essentially, one big physics experiment), but also the physical theatre and circus skills levels are extremely high. A pleasure to behold.